This unit allows a Fork Truck operator to deliver loads to or pick up loads from a Power Conveyor while maintaining load integrity. These Stations also can be utilized when loads are delivered by Pallet-sleeve Forks. This is a modular, self-contained Fork Truck Entry Station with three (3) strands of Powered Mesh-Top Belt, pendant-switch activated Jog Forward controls, allowing easy installation into a new or existing plant layout. The standard unit is 8′ long with a 13” wide center strand. The Over-All Width and widths of the two (2) outside strands is 63” wide. Standard Sleeve Stations are designed for a typical 9” wide by 6” high x 5′ long pallet sleeve that is utilized for load retrieval and delivery. Individual Electrical Control Panels are provided for existing installations. 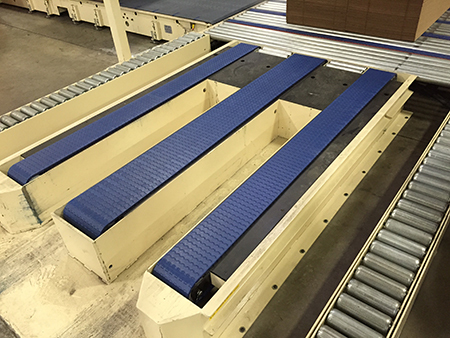 The Sleeve Station includes Non-Power Roller Ramps at the end of the void to assist narrow sheets transitioning onto the conveyor downstream. Drive: 1 hp totally enclosed industrial rated gear-motor with reversing capability. Drive package located within and under the device. A Positive Run Photoeye can be included on the downstream end of the center strand. An Overhead Pendant-switch can also be provided for jog forward and reverse control. One end of the base plate can include a 90 degree angle to be embedded into the floor (requires saw cut or trench by customer). The 3” x 3” angle will be field-welded to the base plate at the time of installation. Unit Height: 12” TOR level.